Inside my suite onboard Azamara Journey I found a new magazine called "World Wildlife at Sea." The special edition publication produced for Azamara Club Cruises by World Wildlife Fund (WWF) contains specially curated stories about WWF's recent work to protect ocean habitats and wildlife around the world. At first, I gave the emerald-green-covered magazine a cursory glance before directing my attention to the daily program “Pursuits.” However, after meeting with Heike Berdos, Hotel Director on Azamara Journey, I learned that the boutique cruise line was launching a new five-year partnership between Azamara Club Cruises' parent company Royal Caribbean Cruises Ltd. and World Wildlife Fund. Heike told me to keep an eye out for more information about the launch of the partnership in the coming days. I got an insider tip to look for stuffed panda bears at the gift shop or at the guest relations desk. The plush animal looks like a toy but in fact, it is the same animal from WWF's logo and a special gift for those wanting to make a donation to support the partnership between the cruise line and the conservation organization. I am happy to report that my daughter and I were the first people to donate to the program onboard the Azamara Journey. We took our new friend with us into port and had fun taking selfies with “PB”, our panda bear. 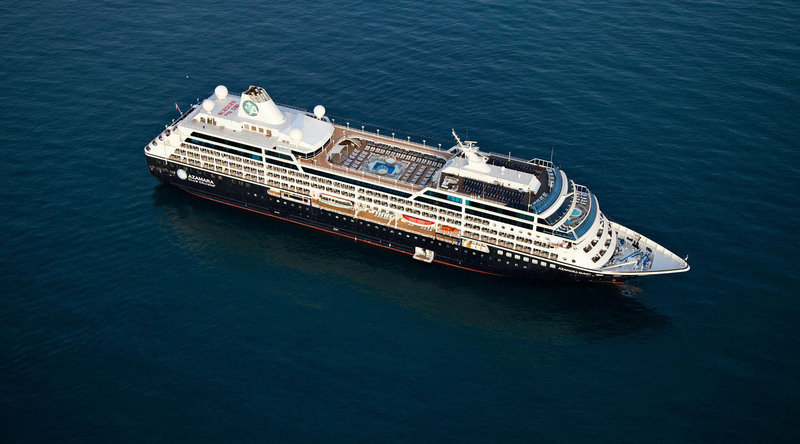 I have since read the "World Wildlife at Sea" magazine and enjoyed learning about what Larry Pimentel, President and CEO of Azamara Club Cruises, had to say about the partnership between the cruise line and WWF. The cruise line is committed to working with WWF to improve their environmental performance in key areas, support global ocean conservation efforts, and engage guests on the importance of protecting marine ecosystems and the species that call them home. For me, the pathway to engagement starts with education. I can't discuss topics that I know little about. Sure, making a donation to the program was a given, but learning more about ways I could help do my part in the stewardship piece would take some more education. Lucky for me I don't have to spend a lot of time figuring out how to get myself up-to-speed about the importance of protecting marine ecosystems. Azamara is one step ahead and invited Dr. Nikhil Advani, a climate scientist based in WWF's Washington, D.C. office, onboard to help guests learn about WWF and human responses to climate change. We have had three opportunities to listen to Dr. Advani discuss his work and World Wildlife Fund. When he is not lecturing during our sea days, Dr. Advani is more than happy to chat with guests about a variety of topics like vulnerability assessments and his work developing and implementing adaptation strategies for WWF priority species. He is very knowledgeable about how communities are being affected by changes in weather and climate, how they are responding, and how their responses impact biodiversity. I had an opportunity to speak with Dr. Advani a couple of times and he told me that he is part of a team of people that will come onboard select voyages to discuss the delicate diversity of life on Earth and how WWF's programs help build a future where people live in harmony with nature. Dr. Advani was born and brought up in Kenya and received a Bachelor's Degree and PhD at the University of Texas at Austin.